Is your mouth watering yet?! 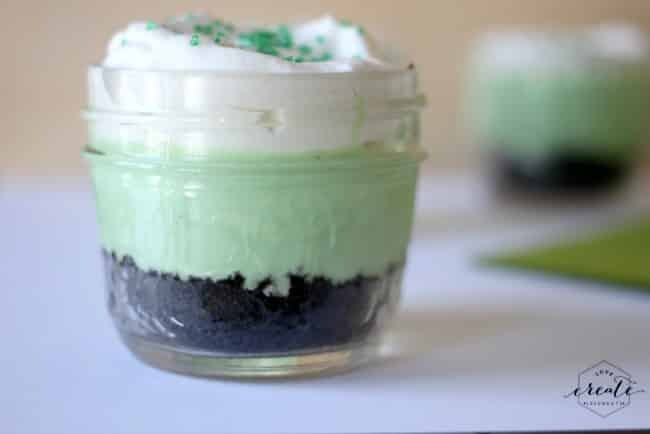 If you are a fan of mint, chocolate, or cheesecake you are gonna LOVE this recipe. Lucky for me, I’m a fan of all three! , lol. 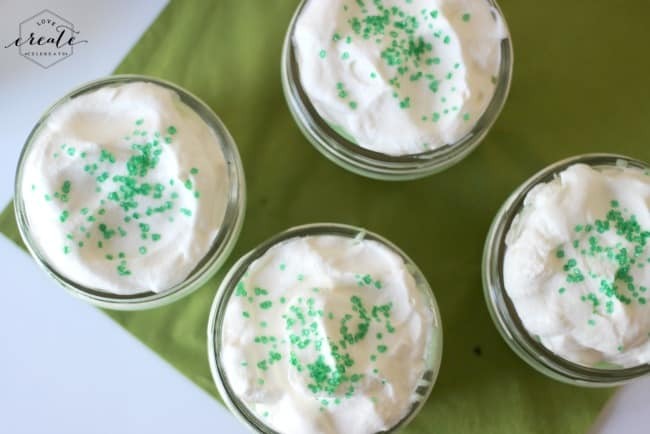 I’m on a mission to make a “Dessert in a Jar” for every holiday, and this dessert does not disappoint. 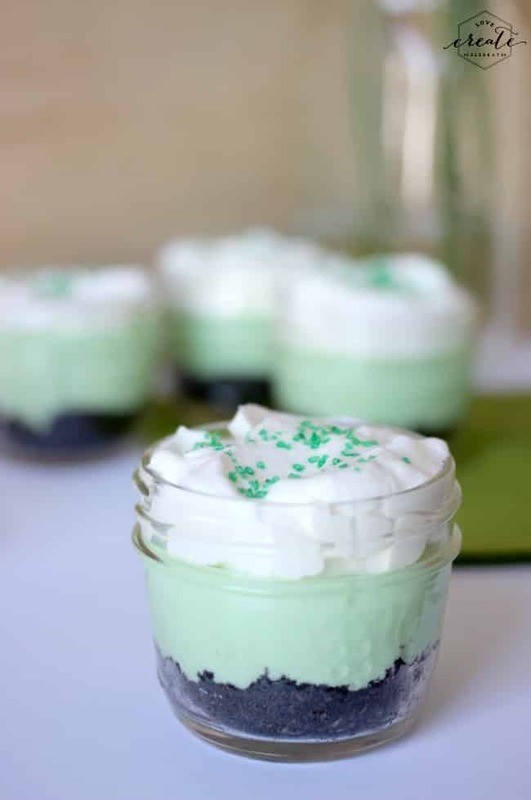 A delicious chocolate and mint dessert that will leave your friends and family wanting more! Beat cream cheese until fluffy. Gradually add in sweetened condensed milk until combined. Add in vanilla and peppermint extract. 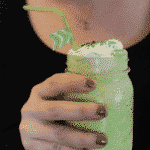 Add green food colouring until you find your desired colour. Pour over the prepared crust in the mason jars (or pie plates) and chill for three hours. 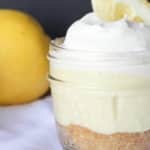 Whip your whipping cream and put on top of cheesecake. Put sprinkles on top just before serving. 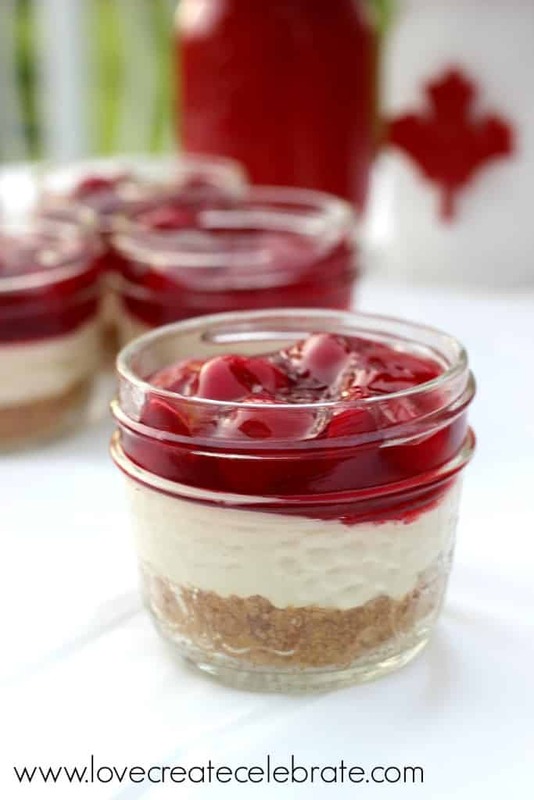 If your love of cheesecake is what brought you here, you are definitely going to want to check out this No Bake Cherry Cheesecake recipe too! This looks so yummy!! Shared. 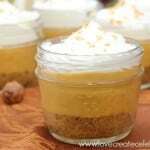 These look so good and I love the individual servings in jars! No bake cheesecake?? Sign me up! 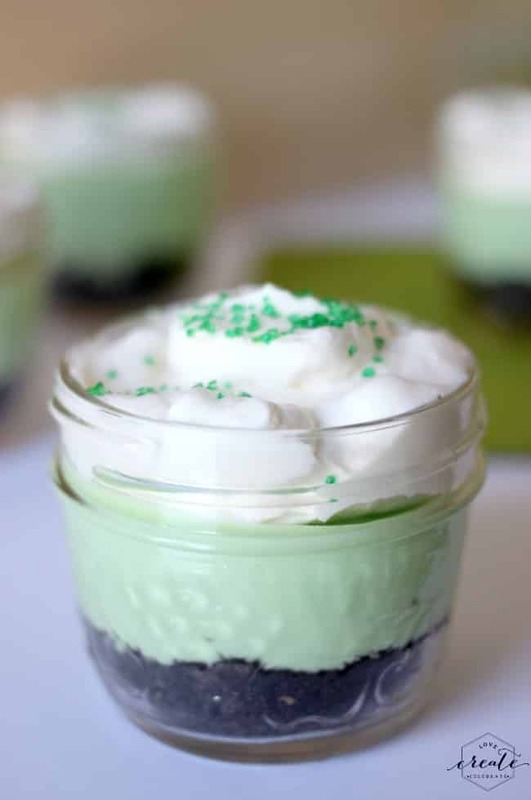 So cute for St. Patty’s Day! Oh my soul, yum. I’ll have to try these soon! Oh man, I’m drooling!! These look so yummy and are beautiful. Great pictures too! Pinned! Yum, yum, yum! Looks fabulous! I’d so love you to come link up tomorrow at our new recipe link party! My son would die over these. Thanks for sharing, pinning! These look delicious! My kids wold love to help make something like this. Oh I bet this is delicious! They look so pretty too. I will have to try this sometime. I like the idea of putting them in the jars. Be easy to take along or give as a special treat to someone. Thanks for sharing your recipe. Yep, my mouth was watering at the very first picture. 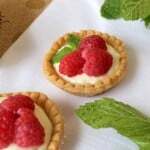 This dessert sounds delicious and looks so pretty too. These look so good! Thanks for sharing on Creative Circle! I think I may have to disagree with you that the mini mason jar is the perfect dessert size, if so, I definitely would want another helping! 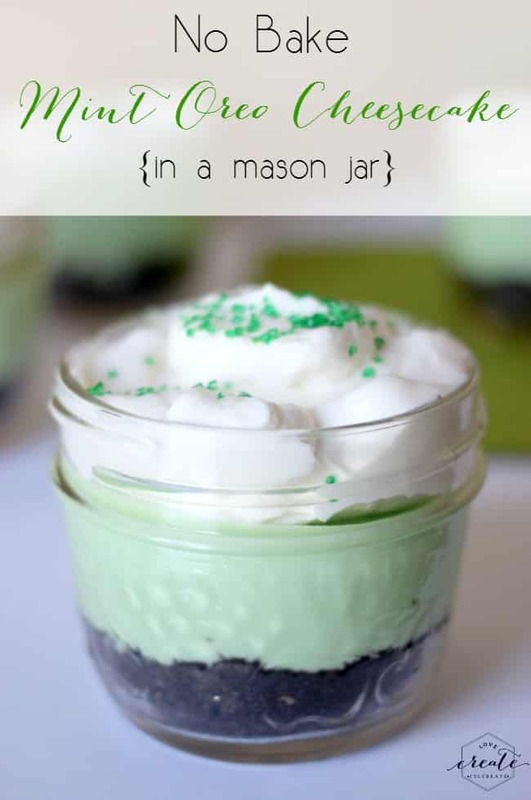 :) These sound and look absolutely delicious and they are extremely cute in the mini mason jars. 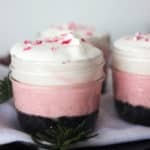 I love your idea of having a dessert for each holiday! What a fun idea. These look SO GOOD!! I love individual things! 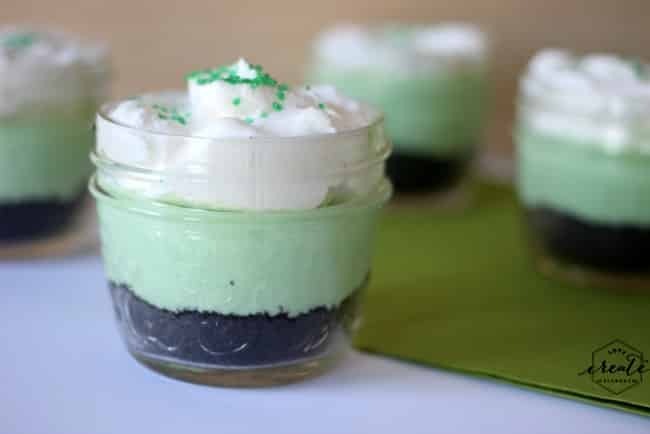 Going to try these for St. Patty’s Day. Looks really good! Visiting from Dream to Reality party. Aren’t things made in mason jars so cute!? 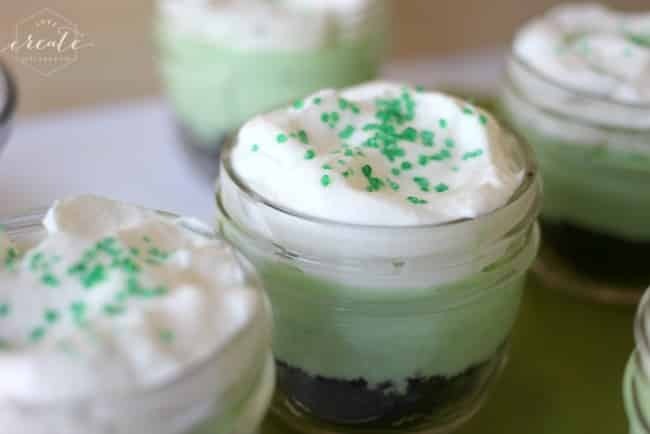 I love the idea of chocolate and mint in a no bake cheesecake! Thanks for linking up with us at The Wednesday Showcase! It’s seriously delicious! You will not regret making this one! 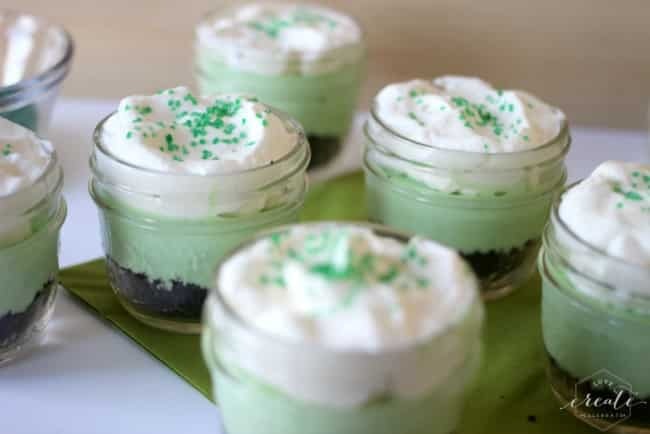 Oh my, I love mint and I love cheesecake. Homerun! Thanks for sharing at Merry Monday! These look amazing!!! I was wondering tho, how long will they keep? I want to send some to my friend in CA and I live in WA. Do you think they will last the trip? Thank you so much for any suggestions! !